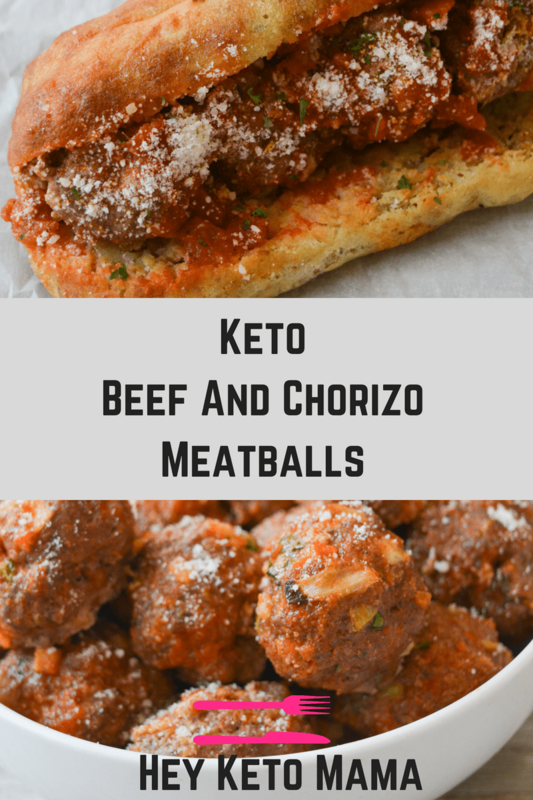 These Keto Beef and Chorizo Meatballs are a very easy, very low carb dish that can be used in a wide variety of ways. Bake them up for your next event, or throw them on a low carb bun for a very filling meal. Total Game Changer! 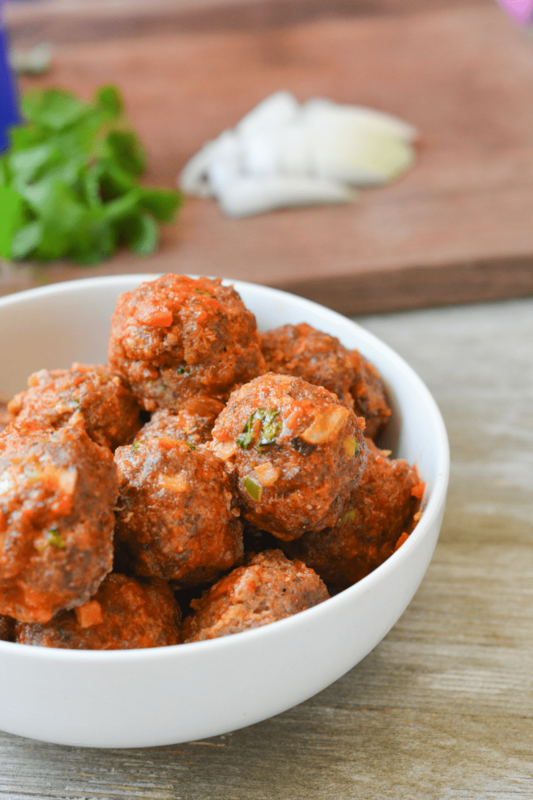 Meatballs are the perfect appetizer to liven up your party, game day, or throw on a bun for a delicious, saucy sandwich. This recipe definitely takes the flavor up a notch by combining hearty beef and spicy chorizo to make pure awesomeness. If you’re not familiar with chorizo, it’s a spicy, Mexican style pork sausage that is featured in my Cheesy Chorizo Dip and Chorizo Omelette recipes. I love this meat, but one important note to share is that all chorizos are NOT created equal. I’ve previously used some of the cheaper brands that can easily be found in just about any big box store, but found that they let out a TON of grease, and the flavor isn’t stellar. 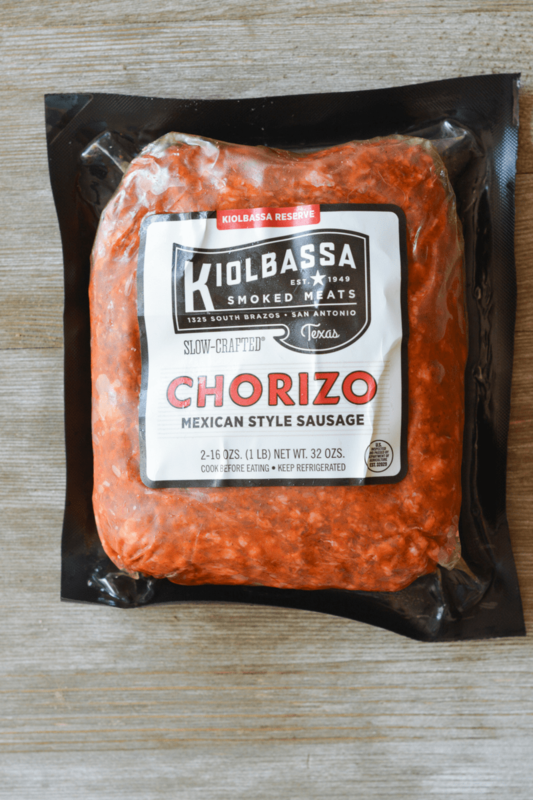 Recently, I found Kiolbassa brand chorizo at Sam’s Club (I previously became addicted to their Polish Sausages) and it’s been a total game changer. Here’s a link to help you find the Kiolbassa brand near you. I seriously love all of their quality meats. 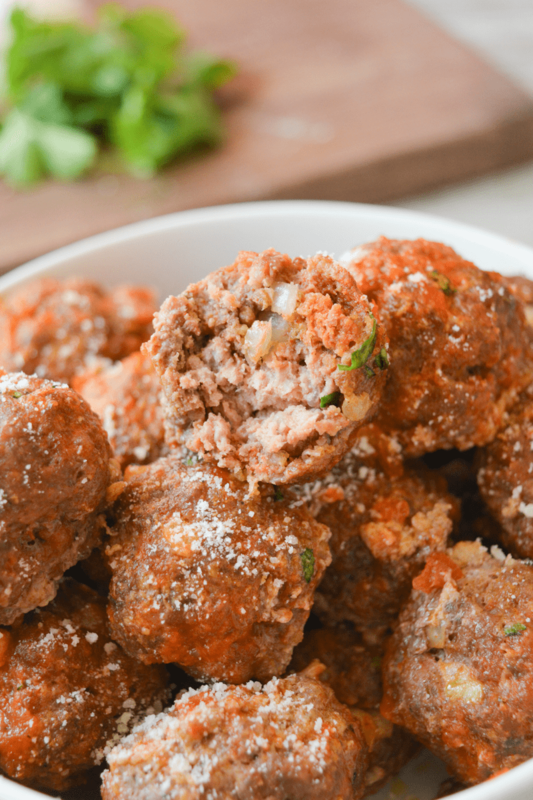 So are you ready for a recipe truly as simple as mixing the ingredients in a bowl, rolling up the meatballs, and putting them in the oven? 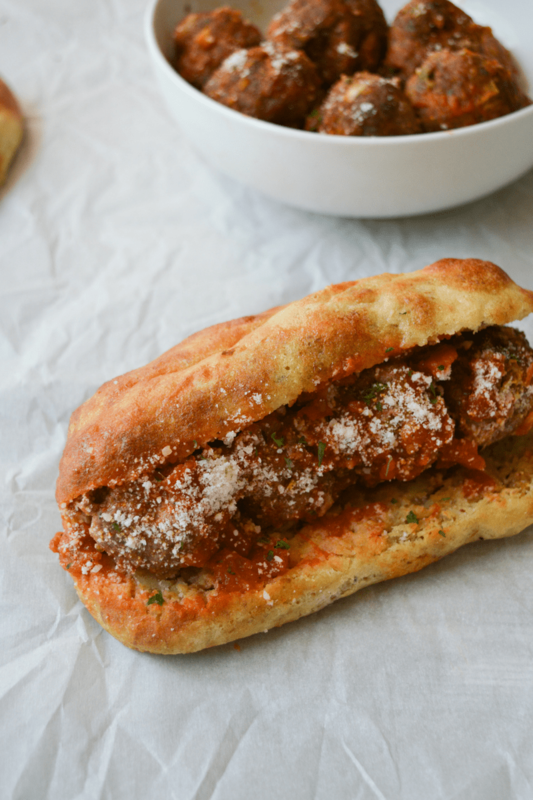 And if you’re wondering how to make that mouthwateringly amazing meatball sub, just use my keto dinner rolls recipe to make the bun, and add some marinara! Rao’s is a great, low carb option. Preheat oven to 400 degrees. Line a large baking sheet with foil or spray with non stick spray, if desired. In a large bowl mix all ingredients including your choice of seasoning with salt and pepper, to taste. Take a couple tablespoons of meat mixture and roll into a ball, about 2 inches in diameter. You can make larger if you prefer, it will just make less. 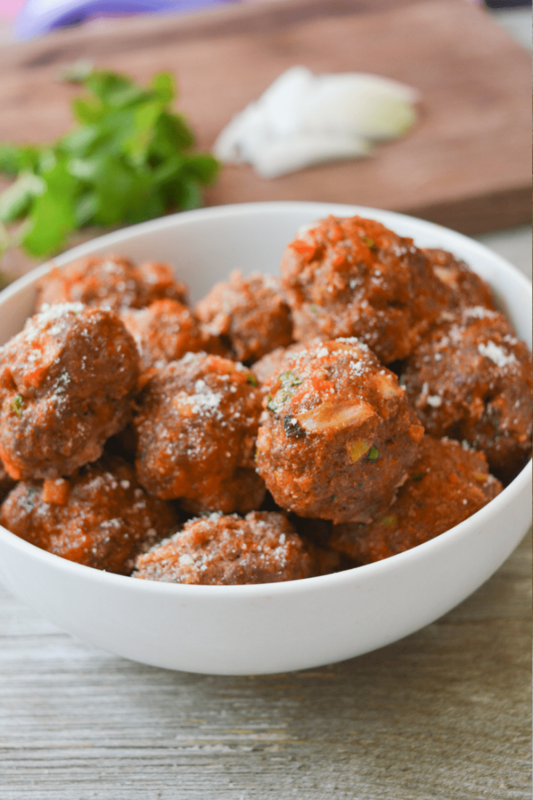 Place meatballs on baking sheet. Bake for 17-20 minutes, or until meatballs are browned and fully cooked through. Keep an eye on them close to the end of cooking time, all ovens are different and they may cook quicker. Alternatively, if you made larger meatballs they may require a few extra minutes in the oven. Grinding pork rinds: To make these I place an an ounce or two of pork rinds into the food processor and pulse until they're fine crumb like and then measure. I've noticed some brands are more dense than others so the measurements by weight may vary a little. Just be sure to have 1/2 cup measured after pulsing them. Sub pork rinds with 1/2 cup almond flour, if desired. I prefer pork rinds because they just add a little salt, no other flavors. Subbing with almond flour will change taste and increase carbs. You can freeze the meatballs after cooking them. Simply toss in your favorite sauce in a skillet, oven, or microwave to reheat for a quick meal.